A light romantic comedy about a girl who gains divine powers? Stop me if you’ve heard this before. When you already have Kamisami Kiss in your collection, or indeed Ah My Goddess, do you really need another example? 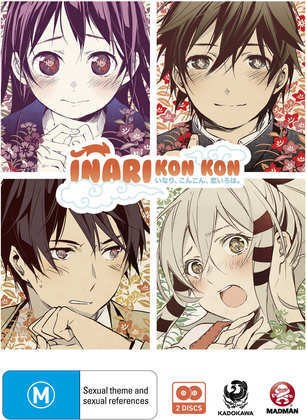 Certainly no UK distributor has felt the need to release Inari Kon Kon at this time, but intrigued by the title, I imported the DVD to take a look, and found a nice, enjoyable, light romantic comedy. Just what it says on the tin. It’ll serve to entertain with its delightful characters and engaging story, but the only thing that stands out about this show is the title. It’s been a long wait, but we finally get to see what happens next on the world of Remnant with RWBY Volume 4. Volume 3 ended on quite the cliff-hanger, with a magical school attacked, and characters hurt, or worse. The protagonist team splits up in this collection, to go on adventures of their own, or to face their inner demons and deal with the trauma of prior events, It’s a dramatic high-point for this CG animation from Rooster Teeth, which surprisingly lives up to its aspirations to be a US originated anime. I watched Tokyo Godfathers again. 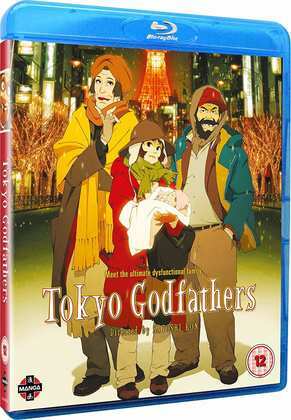 I know it’s barely been half a year, but this heart-warming tale of three homeless people finding an abandoned baby is one of Satoshi Kon’s most accessible films, and it’s always watchable. What’s more, it’s finally got a UK Blu-ray release, and there are aspects of this disc definitely worth reviewing, or re-reviewing as the case may be. Click on the link to see what. 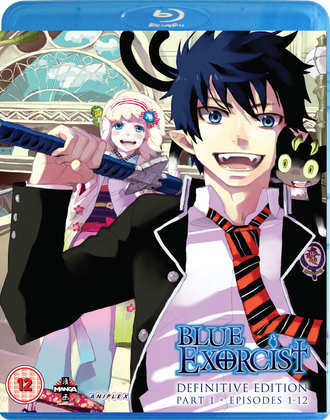 Blue Exorcist Season 1. They took a long running, shonen action manga, and instead of going the long-running series route like so many others, Blue Exorcist got the 26-episode premium animation treatment, with high quality animation and storytelling through-out; even the filler. My second time with Bleach for instance has been depressingly stop-start, as I keep losing interest in the interminable nature of the story, but my third time with Blue Exorcist is just as fresh and invigorating as the first. The tale of the son of Satan, deciding to become an exorcist to give his biological father a smackdown after his adoptive father was killed, grabs the attention from the first episode, and the mix of action, comedy and drama is brilliantly judged. Manga Entertainment initially released the show on flawed subtitle only DVD back in 2012, but subsequently re-released the show without any flaws on Blu-ray in 2013. Here’s my review of Part 1. The show is still available today. Madman Entertainment released Inari Kon Kon on Region 4 DVD in 2015. 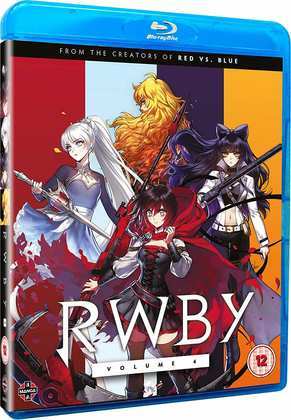 Manga Entertainment released RWBY: Volume 4 on Blu-ray and DVD on October 1st, while they will release Tokyo Godfathers on Blu-ray and DVD on the 15th of October.